PackPlus Is Here! Only A Few Weeks To Go! The Total, Packaging, Processing & Supply Chain Event is coming to Pragati Maidan, New Delhi on 25th July 2018. Time for action! The visitor invitations are already dispatched, the exhibitor directory is under process, tickets are booked, machines to be launched-to be displayed are listed, products are sorted, yes, the industry is all set to witness yet another edition of PackPlus Exhibition at New Delhi. 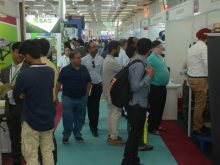 PackPlus, along with SupplyPlus, PackSol, CartonTech and India Converting Show will feature more than 400 companies at the exhibition. The event will host 100+ product launches, 200+ running machines and several other attractions. Talking about few launches planned at PackPlus, Advanced Industrial Micro Systems is launching Hand Held Ink-Jet Printer Model IJP-M3S/M3S; Aztec Fluids & Machinery will launch Fibber Laser, Ishida India will present next generation X-Ray & Checkweigher; Jayalakshmi Poly Packs will offer the Cushion Packaging / Void Fill Packaging; Maharashtra Plastic & Industries will present ‘KOLSITE’ Brand Semi Auto Strapping Machine; Makewell Engineering will launch two lane creamer machines; BENZ Packaging Solutions will present Returnable Packaging, Feather Weight Pallets & Compressed Wood Pallets and Avians Innovations Technology will launch High Speed Doors, Insulated Rolling Shutters. The large gamut of LIVE running machines has always been a key highlight of PackPlus Exhibition. 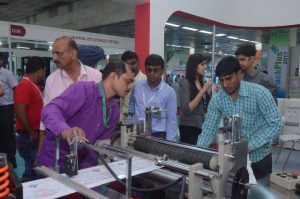 To name a few, Ace Finepack will display Bestcode CIJ Printing & UCS TTO coding machine; Clearpack will offer high speed case packing and shrink wrapping machines; Inpack Fabrications will be demonstrating Automatic VFFS Machine; Jay Instruments And Systems will present Flow Wrap Machine, X- Ray Inspection Machine; KGK Jet India will demonstrate Inkjet printers; Saurabh Flexpack Systems will display KAWACH 700 Automatic VFFS packaging machine and Spheretech Packaging will showcase latest tin making plant from Korea along with other weigh metric and volumetric filling lines. In the PackSol segment AG Ploy Packs (P) Ltd. will present PET & HDPE bottles with creams jar for cosmetic and pharma companies; Ganesh Packaging Store will offer Fillflo Air Cushion Packaging & Shoes Wrap Packaging; Selmex Industries will present Silicone Sealants, Air Bubble Films and Poly Oly Shrink Film; Vikas Packaging will showcase Honeycomb pallets; Teknobyte India Pvt. Ltd. will present Pet Preforms, PET/HDPE Bottles, Jars, Caps-Closures and Guangzhou Hengrui Non-woven Co. will offer laminated paper and laminated nonwoven. Adding value to India Converting Show will be companies like Avtar Mechanical Works, which will present Paper Bag, Making Machines; Hydrotek Engineers will launch Digital Flexo printing Blocks For Photo/ Halftone Printing; Sahil Graphics will present Automatic Paper shopping making machine along with High-speed Non woven bag making & printing machine; Vardhman enterprises will launch a high speed paper cup machine and BST electromat India will offer new division of Automation for printing machines. CartonTech will drive lot of attention with Orange O Tec Pvt. Ltd introducing Digital Cutting Machine ” KoloRado”; 3S Graphic Solutions displaying semi-automatic rigid box machines including plate type dust free grooving machine; Ample Graphics showcasing the new advanced Video-Assisted Positioning System for accurate Rigid Box manufacturing and Neelkanth Manchinery Company displaying Fingerless Corrugation Machine, to name a few. The visitor registrations are in full swing and the event is glad to associate with Trio Motion Technology, which has come forward to become the PackPlus ‘Registration Partner’. 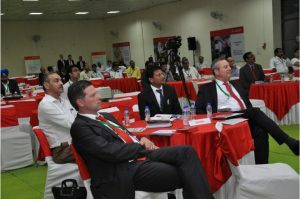 International Packaging Conclave, the knowledge sharing interactive platform, will happen on 27 July at the same venue. The focus this year will be on Safe Packaging: New Regulatory Landscape. The draft of the new “Food Safety and Standards (Packaging) Regulation, 2018” is ready and awaiting final notification soon by the FSSAI. The new regulations are expected to entail significant changes in the supply chain for packaging of food and beverage. The Conclave aims to un-pack the implications of the forthcoming new regulations.